Peer Review is a method of external evaluation and can be used to improve the quality and development of the services and activities. 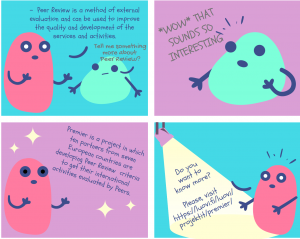 The Peer Review – More Impact, Excellent Results (Premier) is a project in which ten partners from seven European countries are developing Peer Review criteria to get their international activities evaluated by Peers. Premier partnership is working hard to improve the quality of international activities. They are sure that our outputs will benefit you, too. They pilot the criteria and make a training module on Peer Review. They will glad to tell you more in the next dissemination event in Piteå, Sweden 12th April, 2019. The final seminar in the Netherlands in November 2019. Luovi build the project on the experiences and the feedback received of the Strength from Peer Review project. The aim is to widen the use of Peer Review to new quality areas as well as to pilot the materials, criteria and the method in new organizations and countries thus improving also the existing criteria. The project address the objectives of the Erasmus+ program by fostering quality improvements, innovation and internationalization. Enhancing mobility is one of the objectives of Education and Training 2020 framework. When VET providers plan international activities they have to take into consideration national and European policy objectives. Student and staff mobility and development projects are ways to carry out internationality. However, international activities are not always written in the strategies in all the participating countries. VET colleges and students could benefit more from home internationalization activities. Thus, the impact of the activities is not easily to be shown. Continuous quality improvement of VET is a priority in the participating countries. We can actively develop quality management with international partners. In addition, we want to promote Peer Review as an opportunity for continuous professional development of VET teachers as stated in Riga Conclusion 2015 and thus raise the overall quality of VET.